Hama beads are such fun to do, but it can be difficult to find ways to use or display the things that you make. These Hama bead heart frames are great for Valentine's Day because you can personalise them with a photograph of yourself or a loved one, or even just with a picture of something else that you love, perhaps a pet or even a place. If you attach some magnetic strip to the back they can be stuck on the fridge, or you could make a hanging loop with ribbon. You could even embellish them for extra interest, maybe by adding buttons or sequins. These Hama bead frames are all made using the large Hama bead heart pegboard , but you could also use the smaller heart pegboard to make smaller frames, or just use the centre portion of the large heart pegboard. I used red, white and pink for a Valentine's Day feel, but they would also look good in a mixture of colours or in a selection of colours that matches the decor of the recipient. I ironed the beads firmly on one side to make sure that they were nice and sturdy, especially important when the width of the frame is only two beads. Then I ironed the front side slightly less, so that you can still see the definition of the beads and the shapes of the hearts. This is a great Valentine's Day craft for young children because you can leave them to create their own designs. You don't need to stick to a rigid plan, just let younger pre-schoolers place the beads wherever they like, or just create a simple pattern of stripes or alternating beads. They are perfect to pop in an envelope along with your Valentine's Day card as a little extra gift. 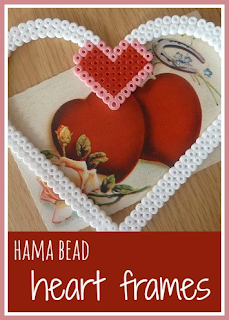 If you enjoy crafting with Hama beads and have a heart pegboard you might also like my other Valentine's Day Hama bead craft - a Hama bead heart hanging decoration.